See www.ridgewaybattle.ca for further information. Some of the previously available material on this web page is temporarily unavailable as it currently being revised into Terror and Border Security in Canada West during the Civil War Era and the Fenian Threat, my doctoral dissertation at the University of Toronto history department, as well as into a book from Penguin tentatively entitled, 1866 Ridgeway: The Fenian Threat and the Battle That Made Canada and scheduled for publication in 2010. The material removed from this website should become available again in the form of a journal article some time in the next eighteen months following May 2007. In June 1866, the Province of Canada (pre-Confederation Ontario and Quebec) was shaken by an event as cataclysmic to its sense of security as 9/11 was recently to that of the United States. A force of nine hundred well armed Irish American nationalists, all sworn to the Fenian cause, attacked Canada across the Niagara River near Buffalo at Fort Erie. Their objective was to destabilize Britain’s rule in Ireland by sparking a military crisis in Canada. Whether the Fenian plan was entirely mad or perfectly plausible remains a question still debated by historians today. The invasion across the Niagara River climaxed with the deaths of seven inexperienced Canadian militia soldiers—boys actually—four were University of Toronto students called out by church bells the previous morning to go and die at a hamlet near Fort Erie called Ridgeway. The volunteer soldiers, ordered in the heat of battle to form into a densely packed square by a panicked command to stand ready for a cavalry charge that would never come, made a perfect target for the expert volleys of concentrated musket fire unleashed by the Fenian riflemen. Many of the Fenians were recently demobilized battle-hardened Civil War veterans who had purchased back from the US government their war-issue weapons at post-war surplus prices. So disciplined was the Fenian fire that the Canadians thought they had come under fire from state-of-the-art Spencer seven-shot “repeater” rifles. In reality the Fenians were armed with an assortment of single-shot muzzle or breech-loaders. 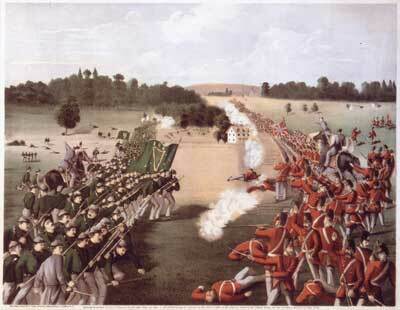 The subsequent retreat of the Canadians forces with their dead and wounded from the Battle of Ridgeway [see also] was a humiliating military defeat on home ground, and was to be celebrated by Irish patriots as their first victory over the British military since Fontenay in 1745 when an Irish Brigade with the French Army routed the Coldstream Guards. While it is generally believed that the invaders would have been defeated by a reinforced and re-grouped Canadian counter-attack, in the end the invasion had been broken by the US authorities’ subsequent interruption of Fenian supply lines across the Niagara River and the arrests of Fenian reinforcements attempting to cross the river into Canada. brass "IRA" buttons and civilian dress with green Fenian scarves. The attack, when it happened was a surprise, but it should not have been. In the years prior to the invasion there had been a gathering fear in Canada of a Fenian assault from the United States aided by a possible insurrection of local Irish Catholic nationalists residing in Canada. This was further compounded by a fear of the United States itself brought to a crisis point by the unfolding Civil War in 1861-1865. As there were mutterings from Union politicians about “compensating” for the possible loss of territory to the Confederacy by the seizure of territory from Canada, Britain began to urgently ship troops to Canada. Blockade and high-sea naval incidents raised the tension further as the Confederacy attempted to develop lines of trade and relations with Britain. Making matters worse, Confederate guerrillas launched a raid from Canadian territory into Vermont and escaped back to the safety of Canada. The fear of invasion by US forces was dramatically palpable in the wake of all those incidents. The city of Toronto lay in the immediate vicinity of the US border directly in the path of a possible invasion. Buffalo was the most likely site for the mustering of US forces for a ground attack into southern Ontario—and in 1866 it would serve precisely that function for the Fenians. Wagons, boats, food, weapons, supplies, and billeting for thousands of Fenians arriving in waves from as far as Tennessee were all concentrated at Buffalo and supported by the city’s native population of Irish Catholics. By the 1860s Toronto also had a large Irish Catholic population of its own with a substantial faction of vocal nationalist activists, Fenian supporters, and even secret card-carrying Fenians, all calling for the independence of Ireland. Long-standing local Irish Catholic and Protestant sectarian tensions in Toronto were caught up in this growing threat of a Fenian invasion. In Toronto, the Fenians penetrated the executive of the militant but well-connected and legal Hibernian Benevolent Society, the Irish Catholic response to the Protestant Orange Order. The question was, how many Irish Canadians would take up arms in aid of the Fenian invasion if it came? That issue fell squarely into the jurisdiction of the Toronto Police under Chief Constable William S. Prince. 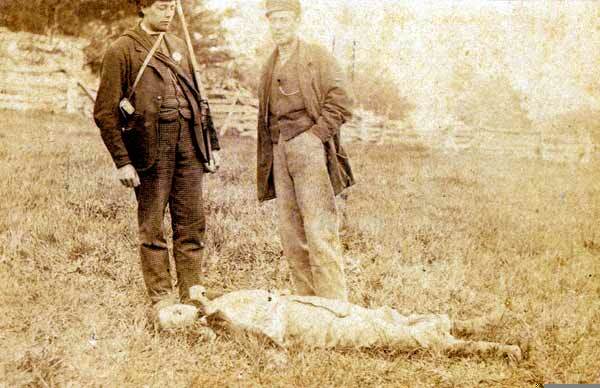 The Chief of Police played an active, and sometimes leading role in assessing and confronting the gathering threat of the Fenians over the years prior to the invasion, not only inside the city of Toronto, but also in areas as near or distant as Buffalo, Detroit, Chicago and New York City. The reach of the Toronto Police intelligence gathering efforts extended beyond the perimeters of the city. This paper describes how Chief Prince collected intelligence reports from contacts, spies and informants on weapons purchases in Buffalo, on Fenian meetings in Detroit and Chicago, and even on the leisure activities of Irish servant girls in New York City. Engraver: McNevin, John, active ca. 1856-1867. While the Toronto Police reached far and wide in its attempt to assess the Fenian threat and recruit agents, it was also prepared to respond militarily to the kind of mass threats it gathered intelligence about. This paper explores the military functions of the Toronto Police parallel to its intelligence gathering function. The article looks at the diplomatic, political and peacekeeping functions of the Chief of Police in those times and how he directed police power from that office during times of crisis. Whereas the early force had served as an intermittent check on lawlessness and was constrained by its size, by its links with the community and by the easy-going, indulgent attitude of the authorities, the mid-century police were called on to discipline in new ways. It became a coercive agency of moral reform, the task force for the new respectability. To be sure, the dominant forces in Victorian Toronto could not always agree on the form police reform should take. But they were always unanimous about the force’s function as a vanguard of ‘improvement,’ active in the campaign against ruffianism, drunkenness, and immorality. Revolver shots were fired by the mob with startling frequency, while stones and other missiles fell among the Police and processionists like hail. Many were seriously injured; and although fully armed not a single man so far forgot himself as to return the fire, but throughout all behaved with remarkable coolness and with a degree of forbearance that was certainly very creditable. The problem here is that the history of the Toronto Police in the decade immediately following it reform in 1859 is a ‘dark age’ for its historians. This is a critical period that falls between the pre-industrial brawling drunken frontier Toronto under a “parish watch” police and the Victorian ‘Toronto the Good’ of the latter part of the century under a professional constabulary deployed for moral reform. This article argues that after the reform in 1859, the former parish-like Toronto Police were doing much more than just curbing ‘mischievous urchins’ seeking to soil crinoline dresses of respectable ladies. The 1860s unfolded long before the moral reformers pressed Toronto Police constables into their roles as “urban missionaries.” This was an era more dangerous and militant then current historians of the Toronto Police acknowledge. This article endeavors to describe precisely the threats confronted by the Toronto Police in those times, how they were perceived, assessed and responded to, and what role Chief Prince played in setting police objectives, priorities and training. The security and intelligence function of the Toronto Police and its early military training to deal with mass disorder are for the first time described here, as are some of the diplomatic peacekeeping functions undertaken by the Chief. This article concludes that the threat in Prince’s estimation at the beginning of the disorders of the 1860s was not the Hibernians, Fenians, or even the Irish Catholics. Prince estimated the more pressing threat to come from entirely opposite quarters—those parallel to the police—the local Volunteer Militia—significantly in a time when the United States was becoming mired in a bloody Civil War of it own. While that perception would be a source of political strife with Toronto City Council for Prince, it will also be the key, at least during one crisis, to a successful diplomatic defusing of a situation dangerously close to exploding in violence in Toronto. Regretfully the remainder of this article is temporarily unavailable as it currently being incorporated into my forthcoming doctoral dissertation at the University of Toronto, Terror and Border Security in Canada West during the Civil War Era and the Fenian Threat, as well in a book from Penguin tentatively entitled, 1866 Ridgeway: The Fenian Threat and the Battle That Made Canada and scheduled for publication in 2009. The currently withdrawn material should become available again in the form of a journal article some time in the next eighteen months following May 2007. Visit here for updates on availability and publication schedule. Nicholas Rogers, “Serving Toronto the Good: The Development of the City Police Force 1834-84”, In l, Victor L. Russel (ed), Forging a Consensus: Historical Essays on Toronto, (Toronto: University Of Toronto Press, 1984.) p. 137. Hereward Senior, Last Invasion of Canada, p.9.